Destinations for Dreamers - Build the Brand. Protect the Brand. Grupos Posadas, Mexico’s largest independent hotel company, has partnered with R&R to rebrand its Fiesta Americana Resort Collection, a group of 12 distinct resorts located in many of Mexico’s premier beach destinations. Posadas is known as a hospitality leader throughout the hotel industry. Its history has been written with passion, dedication and hard work, and rewarded with nearly every significant recognition in the industry. However, the brand has had limited awareness within the United States, with this U.S. visitor audience comprising a significant portion of overall property visitation. Growing the resort collection’s brand profile among this consumer group is a critical step in driving future business. 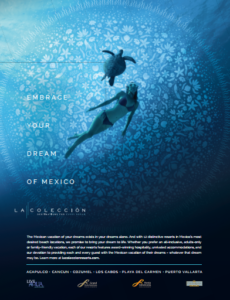 With this challenge firmly in focus, R&R’s team landed on the brand position of “La Colección.” With luxury resorts situated in some of Mexico’s prime coastal destinations, La Colección, was created around the consumer insight that many of us daydream of our next vacation. Making sure the brand stands out from its competition, we identified an opportunity to inspire the dreams of vacationers through storytelling. Utilizing our brand platform, R&R crafted a compelling story inspired by the brand’s unique attributes, grounded in consumer and brand truths, and designed to create an emotional connection with the consumer. We launched Grupos’ new brand by developing a new website, digital content strategy, and a fully integrated digital and social campaign.